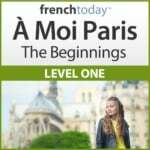 I’ll explain in details the differences between today’s modern spoken French pronunciation, vocabulary, sentence structure… and traditional textbook French and point you to a medium way of speaking which should greatly improve both your understanding and pronunciation of the contemporary French language. Many students learn French pronunciation in school: although this has been changing lately, French language classes traditionally have a strong focus on grammar, written French and literature, with a few chances to practice spoken French pronunciation in conversations. the French everybody (I insist, everybody: me, my mom, my daughter…) speak when in a relaxed environment. These differences affect French Pronunciation its vocabulary and even its grammar and sentence structure. Now, let me make an important point: when I speak about spoken French, I often call it “street French”, referring to the French everybody speaks in the street: in a relaxed everyday setting. I’m not talking about the French used by young people of “the hood”, inner city French… yet almost another language of its own, which I myself have trouble understanding sometimes. 3 – Why is Modern French Pronunciation not Taught in Classrooms? Modern Spoken French is usually not taught in classrooms simply because it is considered “poor” French. Lots of scholars look down on the evolution of a language, and deeply believe that any evolution is actually a retrogression, and weakens the language. I won’t enter the debate. All I know is that modern spoken French is a reality, and if you want to understand real French people or aim at sounding French yourself, you need to study spoken French and prepare your ear for modern French pronunciation. The modern French pronunciation is quite far from traditional classroom French. Just like in English you’d write: “I am going to give”, but would say: “I’m goin’ to give” or even say: “I’m gonna give”, French people will glide over some words in a lighter or a stronger way. Modern French pronunciation is not set in stone. However, everybody uses some kind of gliding, at some level . Modern French is not considered “pretty”. Especially by people who love French, linguists, teachers, people from higher social classes… But it is the reality of French today. I suggest to my French students that they learn “the middle” way; some glidings, but not total street French. “I’m goin’ to”, not “I gonna”. However, it’s important that you understand both modern French and traditional French pronunciation, therefore also train with “full glidings” to understand the French when they speak in the street, or in movies. This is why all of French Today’s audiobooks are recorded at several speeds and levels of enunciation. No other company does it. You will find recordings of French people speaking among themselves. Full blast. It’s way too complicated for a beginner or intermediate students. 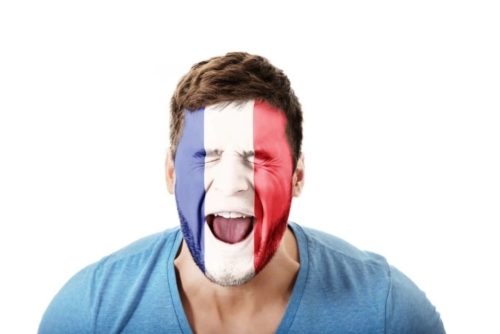 Most French audio methods will feature traditional French pronunciation, with actors enunciating very clearly every single word in the sentence. This is not the reality of French today. Nobody speaks like that anymore! French Today’s audiobook method is the only French learning method to teach both traditional and modern French pronunciation, and still provide level-adapted material to gradually prepare to successfully interact with French people. Now, let’s see what some street glidings are. This is not an easy lesson to write, because French pronunciation evolves all the time, and there are no rules per say. But I’ll give you some examples. Je becomes kind of a “sh” sound. This is quite an extreme gliding and I don’t encourage you to do it. The “ne” of the negative glides with je, tu, nous and vous. This is a medium gliding. Actually in French nowadays, it would be extremely rare to pronounce the ne without gliding it a bit. So, I strongly encourage you to apply this medium gliding. Now, in reality, most of the time in spoken French, the “ne” and even the “n’” totally disappear. This is very, very common in spoken French now. “Que” becomes a K sound that starts the following word. Qu’est-ce que tu fais – Kèss tu fay? The “ce” part of “est-ce que” always glides. Est-ce qu’il fait beau ? = S kil fèbo ? “Il y a” is probably the common French word where the modern French pronunciation is the most blatant. And this often comes to a shock to poor students of French who were never prepared for that! This is why I dedicated a whole blog article to the modern spoken French pronunciation of “il y a” (pronounced “ya”). There are also many, many glidings with object pronouns: le and la totally disappears, lui glides. Here again, I wrote an article about the modern glided pronunciation of the French object pronouns le, la, les, lui, leur (this article comes with audio). 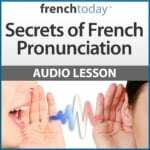 You will find much more about modern spoken French pronunciation with audio recordings – along with traditional French pronunciation in French Today’s audiobook Secrets of French Pronunciation. Then, once you understand the rules of French pronunciation, you’ll be ready to train with French Today’s downloadable French audiobooks: French Today’s bilingual novels are recorded at different speeds and enunciation, to help you master both traditional and modern glided pronunciation. French is alive: through times and fashion, it keeps evolving. Of course, there is a strong base of vocabulary which is unlikely to change much. But then, there is also fashion: an adjective may be used by a generation, then forgotten by the other. Like “swell” in English which was popular in the fifties and is no longer used. Spoken French: Comme je me suis mangé la gueule ! Man, I totally wiped out! Formal French: Ah la la, je suis vraiment tombé fort! Spoken French: On a brainstormé toute la journée au bureau. We brainstormed all day at the office. Formal French: On a bien réfléchi ensemble toute la journée au bureau. Other foreign language influences, in particular Arabic. Spoken French: Je la kiff. Formal French: Je la trouve très attirante. So there are definitely several layers to mastering French Vocabulary! 9 – Are You Learning The Right French Vocabulary? It’s important that students get a feeling for the vocabulary words they are learning. On the other hand, I hear too many students who learn French with traditional French literature from the 19th century and use words or expressions that are absolutely outdated now. So, it’s important that you learn not only French vocabulary, but also the context in which it is best used. To achieve this, there is nothing better than learning French within the context of a story. And this is only for the vocabulary part. Many grammatical constructions such as asking questions also change in modern spoken French. Qu’est-ce que tu fais ? = tu fais quoi ? Pourquoi allez-vous en France ? = vous allez en France pourquoi ? In modern street French, we tend to no longer use “est-ce que” nor inversion. Instead, it’s the tone of your voice that shows we are asking a question: we just say the statement, then we raise our voice. Il habite en France ? Does he live in France? If we are using an interrogative expression (why, when, who, at what time etc…), the expression will be placed at the end of the street French question. Tu commences à quelle heure ? At what time do you start? Vous travaillez avec qui ? With whom do you work? This is particularly confusing for students of French who often never studied this way to ask a question in French class, and are totally confused by the word order and therefore freeze when they need to answer in French. French Today’s audiobook “Secrets of French Conversation” explains in depth all the different ways of asking questions in French, including street French, all with audio recordings and plenty of exercises. Spoken French: Elle est top ta réponse ! When does the cleaning lady come exactly on Monday? Spoken French: La femme de ménage, lundi, elle vient quand exactement ? Formal French: Quand exactement la femme de ménage vient-elle ce lundi ? See how in spoken French, you got the key info very clearly: “la femme de ménage” “lundi” “vient quand”. I could also have said “la femme de ménage vient quand lundi”… That would have been even more to the point. There are several possibilities! So, here again, I don’t suggest you speak this way necessarily. But you need to be able to understand it and therefore learn with a method which shows this to you. Unfortunately, some French grammar mistakes are also very common in spoken French. Believe it or not, but the French Subjunctive is actually hard for French people as well. Nowadays, it’s quite common to hear Subjunctive mistakes. Same goes for past participle agreements. Some grammatical constructions are also affected. For example, it’s common to hear “la copine à ma soeur” instead of “la copine de ma soeur” (my sister’s friend). and French mistakes, which are… well, not just poor French, but simply real mistakes! Voilà, I hope you now understand more the difference between modern French, the French you’ll actually hear when you go to France and in modern French movies, and the “textbook” French that you’re likely to have studied in school and with traditional French learning methods. Both are part of the reality of French today. I suggest you check out my French audiobook method to learn French the smart way today.